I have been photographing horse shows at the New York State Fairgrounds indoor horse arena called the Coliseum for the last 15 years. I’ve never been happy with my results. Having to resort to slow shutters and panning or use flash which wasn’t very flattering to the rider or horse. Last weekend I attended the Central New York Reining Horse Association Show with a friend’s Nikon D700 camera and my Nikon 70-200VR f/2.8 lens. If there was any doubt in my mind this will be my next camera, it is totally gone now. I was able to set the shutter speed to 1/500th of a second and get great exposures with ISO ranging between 2000 and 6400. 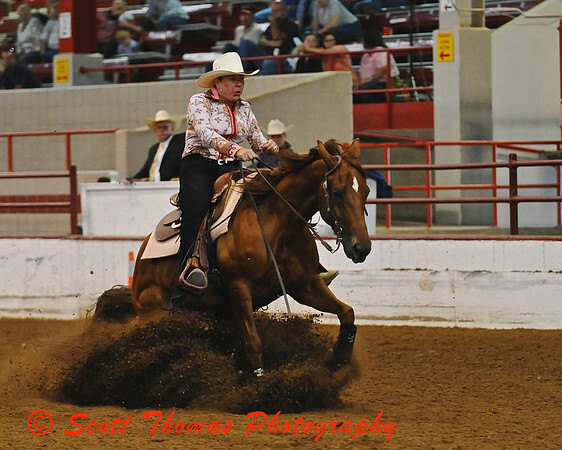 Reining horses are famous for their sliding stops like this one (ISO was 3600 here). Reining horse digs into the dirt at the CNY Reining Horse Association Show in Syracuse, New York. The Nikon D700 has a fast continuous shutter mode and 3D auto focus tracking so I caught this sequence of one of the riders coming in for a stop (ISO ranged between 2000 and 4000 through this photos). 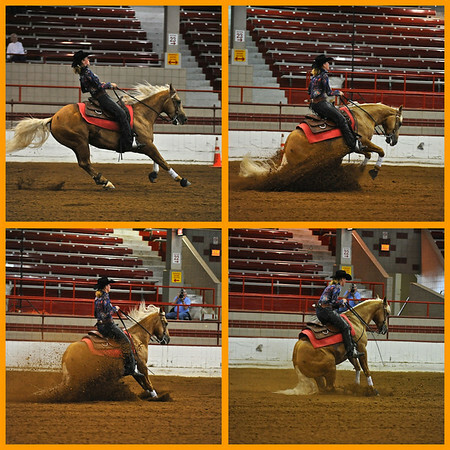 Reining horse sliding stop sequence. This entry was posted in Animals, Sports and tagged central new york, cny, d700, fairgrounds, horse, new york, nikon, Photography, reining, show, syracuse. Bookmark the permalink. It is realy interesting to see these usually hidden movements, and study how the horse are reacting. I can imagine how much fun you will get, when you are ready to buy your next camera, and how many interesting photos you will show to your blogreaders. I agree, seeing how the rider and horse move to ensure a safe slide over time shows the skill of each. The muscles of the horse is what draws me to these pictures. I’ve been shooting with the D700 since late October 2008 and it is an awesome camera. I shoot a lot in low light no flash allowed and could not do my work without the ability to shoot at ISO 1600 and higher. My D200 worked pretty well in those situations but the D700 is so much better there is really no comparison. You will not regret it when you decide to buy one. I know I won’t regret it, Laurie. It’s the getting it that’s going to take some time. 🙂 I knew the high ISO images would be good but it still blew me away to actually see it in my photos. I only have the D700 for a few more days and then it goes back to my friend. Sure does give me incentive to keep saving up for it. If cars and kitchen appliances would stop needing fixin’, I might get it by summer’s end. We’ll see. These are really outstanding images. Looks like you are giving that camera a good run for it’s money! While you are getting your new D700, mind picking one up for me too. I love that extra speed. Sure, Bob, just send me your address and credit card number and I’ll get one right out to you. Please allow 5 years for shipping and handling. Thanks! I really love the first one in the series, the rider and the horse’s foreleg in perfect alignment. Good luck with appliances and cars for the rest of the summer . . . ! Wow! Scott…those are awesome photos. I could not afford the D700 and thought about getting the D300 but now I may have to rethink this. The shots I took at the horse show were at ISO 800. When the ISO was set at 1600 it produced way too much noise for me to be happy with the photos. I try not to use flash, it doesn’t look natural enough. I love those pictures you took. Cindy, the D700 handled the lighting perfectly in the old Coliseum. I just set my shutter speed and let the ISO go where it may without worrying about it. Though is it much more expensive, if this is the type of photography venues you like to shoot in, you should consider the D700.